At Memphis Café & Bar you order burger - only! This was the advise from a friend that lives in the neighbourhood. I ordered pasta. That proved my friend right! The main asset of Memphis Café & Bar is its location. 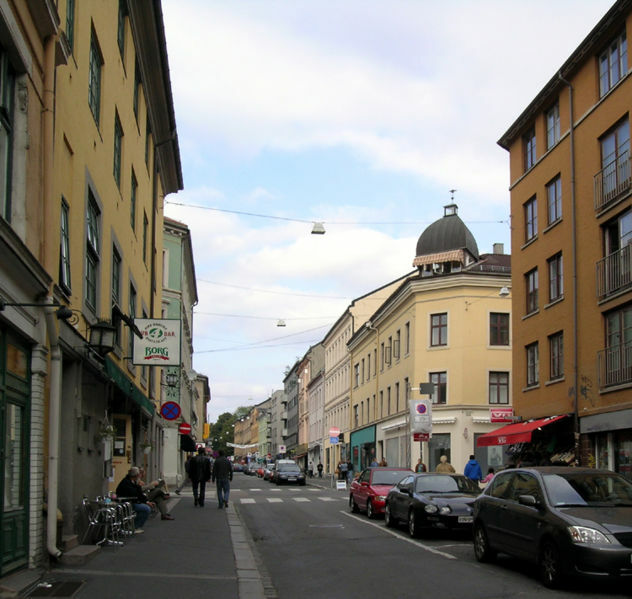 It is located in the trendy Grünerløkka area, a downtown area just a short walk from Oslo Central Station. This is an area packed with restaurants, bars, and coffee where you can relax after you've roamed around the area shopping in the many small boutiques. Interior; trendy - grey and black, with large windows facing the street, you are on display while eating. The large stone tables and black chairs are comfortable, but I find the interior a little impersonal in my mind. Seated along the windows there are generous space into the room, but a little bit cramped towards the other tables in the row. Decent service at Memphis Café & Bar, having a staff that smiles at you and takes your order swiftly is a good thing. I ordered a pasta dish with bacon in a cream sauce. I got my beer without delay, but I did have to wait a little bit too long for my food. I do not mind wait for the food if the quality is high, in fact it may mean that the cook prepares the food carefully from scratch. I am sad to say that this was not the case with the pasta at Memphis Café & Bar. The penne rigate was either overcooked, or hard as a result of the dish being baked in the oven before serving. The bell peppers had a nice crunch and must have been added fresh to the dish. But where was the taste? The dish had hardly any seasoning added by its creator. To add a little interest to what I ate, I asked for X-tra parmesan cheese, salt and pepper and I even added a little Tabasco to get an interesting dinner. With the help of all these ingredients, the pasta dish finally started to taste of something, but I really doubt whether this was what it was supposed to taste. "You need to have some greens in order to have any reason to eat what else (unhealthy) that may be left on your plate. Eat your greens!!" Do not misunderstand me. I am for a tasty salad, but made from good ingredients with care and served on a different plate. So I am definitely going to listen to my friend IF I dine at Memphis Café & Bar again and order Burger. This as he definitely enjoys a good meal and clearly sees what is good and what isn't. And this is a piece of advise for you to follow as well.